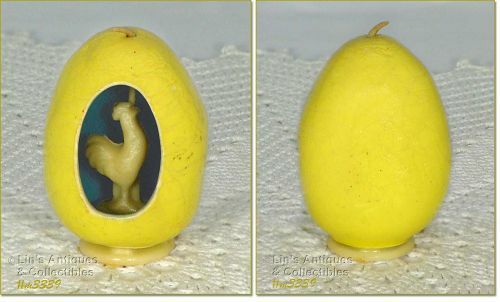 This listing has two adorable Gurley egg shaped Easter candles! These are the type with a wax “animal” inside the egg – the wick runs through it. Both eggs are yellow, one has a duck (or chick) inside and the other has a squirrel. 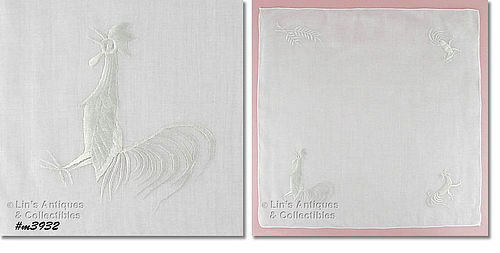 This is an unusual hanky – it’s white with embroidered white roosters in 3 corners and embroidered white grain in the other! Hanky measures 16 ¾” x 16 ½” and is in excellent condition. This is a most unusual candle and although the label is missing, it is a Gurley candle! It’s shaped like an egg (open on one side) and there’s a white rooster inside. Egg is yellow and measures 2 ¾” tall, 2” wide. The little rooster is white and is approximately 1 ½” tall. 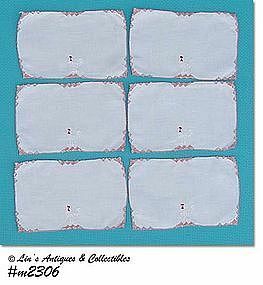 Aren’t these a neat variation of the rooster cocktail napkin? Just look at the work on the edges! Super items, super condition. 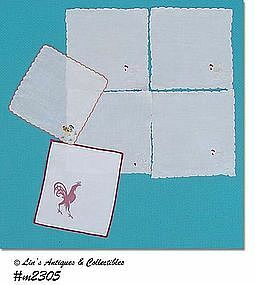 I’ve placed an assortment of rooster cocktail napkins in this listing! There are 3 with roosters perched on a glass, 1 with rooster on a stein, 1 printed rooster, and 1 colorfully embroidered rooster. All are in excellent condition, laundered, lightly starched, and ironed. 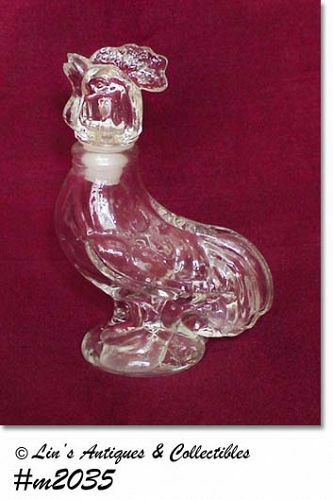 This is a cute little rooster shaped glass candy container! Measures 4 3/8” tall (at tallest) and is in very good condition – he has a small rough place on his beak and, using a magnifying glass, I couldn’t be certain if it’s production or from “use”. There appears to be some lettering on the bottom of container but I couldn’t see it clearly enough to tell you what it is. At any rate, he’s a cute little rooster and a great addition to a collection. This listing has a beautiful and difficult to find McCoy planter -- the rooster on a wheelbarrow! Rooster is yellow with black/brown accent color and still has some of the original orange cold paint on his comb. The wheelbarrow is green with shiny over-glaze and bottom is marked McCoy, USA with the letter "E" inside bottom.